Relying on God is man’s greatest wisdom. 16 Bible verses about relying on God help you learn to rely on God in any difficulty and danger and give you confidence and power. Many sorrows shall be to the wicked: but he that trusts in the LORD, mercy shall compass him about. Trust in the LORD, and do good; so shall you dwell in the land, and truly you shall be fed. Commit your way to the LORD; trust also in him; and he shall bring it to pass. Is not this your fear, your confidence, your hope, and the uprightness of your ways? Though it be given him to be in safety, where on he rests; yet his eyes are on their ways. 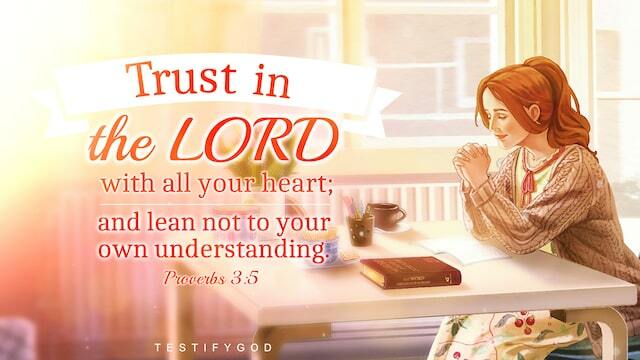 Trust in the LORD with all your heart; and lean not to your own understanding. For the LORD shall be your confidence, and shall keep your foot from being taken. He that handles a matter wisely shall find good: and whoever trusts in the LORD, happy is he. Then he answered and spoke to me, saying, This is the word of the LORD to Zerubbabel, saying, Not by might, nor by power, but by my spirit, said the LORD of hosts. » You may be interested in reading more on our Bible Verses by Topic page, or in the articles below . Easter is a very important day for Christians to celebrate the resurrection of the Lord Jesus. Here are 18 must-read verses for you to read and they will help you better know the gospel of the Lord Jesus. Matthew 16:21 From that time forth began Jesus to show to his disciples, how that he must go to Jerusalem, and suffer many things of the elders and chief priests and scribes, and be killed, and be raised again the third day. Matthew 27:53 And came out of the graves after his resurrection, and went into the holy city, and appeared to many. Matthew 28:5-7 And the angel answered and said to the women, Fear not you: for I know that you seek Jesus, which was crucified. 6He is not here: for he is risen, as he said. Come, see the place where the Lord lay. 7And go quickly, and tell his disciples that he is risen from the dead; and, behold, he goes before you into Galilee; there shall you see him: see, I have told you. Luke 24:7 Saying, The Son of man must be delivered into the hands of sinful men, and be crucified, and the third day rise again. Mark 16:6 And he said to them, Be not affrighted: You seek Jesus of Nazareth, which was crucified: he is risen; he is not here: behold the place where they laid him. » We’d like to share with you the articles: • 3 Truths About the Resurrection of Jesus Christ We Should Know • True Meaning of Prophecy “the Resurrection of the Dead” John 2 :19 Jesus answered and said to them, Destroy this temple, and in three days I will raise it up. John 6:40 And this is the will of him that sent me, that every one which sees the Son, and believes on him, may have everlasting life: and I will raise him up at the last day. John 10:18 No man takes it from me, but I lay it down of myself. I have power to lay it down, and I have power to take it again. This commandment have I received of my Father. » You may be interested in reading more: • Jesus Eats Bread and Explains the Scriptures After His Resurrection • The Lord Jesus’ Words to His Disciples After His Resurrection John 14:19 Yet a little while, and the world sees me no more; but you see me: because I live, you shall live also. Acts 1:3 To whom also he showed himself alive after his passion by many infallible proofs, being seen of them forty days, and speaking of the things pertaining to the kingdom of God. Acts 2:24 Whom God has raised up, having loosed the pains of death: because it was not possible that he should be held of it. Acts 2:32 This Jesus has God raised up, whereof we all are witnesses. Acts 17:31 Because he has appointed a day, in the which he will judge the world in righteousness by that man whom he has ordained; whereof he has given assurance to all men, in that he has raised him from the dead. Acts 26:23 That Christ should suffer, and that he should be the first that should rise from the dead, and should show light to the people, and to the Gentiles. Colossians 1:18 And he is the head of the body, the church: who is the beginning, the firstborn from the dead; that in all things he might have the preeminence. 2 Timothy 1:10 But is now made manifest by the appearing of our Savior Jesus Christ, who has abolished death, and has brought life and immortality to light through the gospel. 2 Timothy 2:8 Remember that Jesus Christ of the seed of David was raised from the dead according to my gospel. » We’d like to share with you the articles: • Does the Lord Jesus Saying “It Is Finished” Mean That God’s Work of Saving Mankind Is Finished • How Will Jesus Return? Have You Welcomed the Return of Jesus? Peace be with you all! Dear brothers and sisters, if you have any understanding or enlightenment from God, you’re welcome to share with us.1. Via the online chat window at the bottom right corner of the screen.2. Send an email to info@testifygod.org.We sincerely hope we’ll grow spiritually through sharing with each other. Why does God allow suffering? These Bible verses will help you understand God’s will and keep your faith in God in sufferings. Romans 8:2 And we know that all things work together for good to them that love God, to them who are the called according to his purpose. Psalm 57:1 Be merciful to me, O God, be merciful to me: for my soul trusts in you: yes, in the shadow of your wings will I make my refuge, until these calamities be over. Jer 32:17 Ah Lord GOD! behold, you have made the heaven and the earth by your great power and stretched out arm, and there is nothing too hard for you. Romans 8:37-39 No, in all these things we are more than conquerors through him that loved us. For I am persuaded, that neither death, nor life, nor angels, nor principalities, nor powers, nor things present, nor things to come, Nor height, nor depth, nor any other creature, shall be able to separate us from the love of God, which is in Christ Jesus our Lord. » Read more on our why does God allow pain and suffering page, or click on the related articles below. • Why Isn’t Suffering Such a Bad Thing? Here Is God’s Will • Sovereignty of God Over Sufferings: It Contains God’s Good Intentions • I Saw God’s Protection in Suffering Romans 5:3-5 And not only so, but we glory in tribulations also: knowing that tribulation works patience; And patience, experience; and experience, hope: And hope makes not ashamed; because the love of God is shed abroad in our hearts by the Holy Ghost which is given to us. John 16:33 These things I have spoken to you, that in me you might have peace. In the world you shall have tribulation: but be of good cheer; I have overcome the world. 1 Peter 5:10 But the God of all grace, who has called us to his eternal glory by Christ Jesus, after that you have suffered a while, make you perfect, establish, strengthen, settle you. To him be glory and dominion for ever and ever. Amen. 2 Corinthians 4:16-17 For which cause we faint not; but though our outward man perish, yet the inward man is renewed day by day. For our light affliction, which is but for a moment, works for us a far more exceeding and eternal weight of glory; 2 Corinthians 1:4-5 Who comforts us in all our tribulation, that we may be able to comfort them which are in any trouble, by the comfort with which we ourselves are comforted of God. For as the sufferings of Christ abound in us, so our consolation also abounds by Christ. » Most people also watch: Best Christian Family Movie “Where Is My Home” | God Gave Me a Happy Family (English Dubbed Movie) Peace be with you all! Dear brothers and sisters, if you have any understanding or enlightenment from God, you’re welcome to share with us.1. Via the online chat window at the bottom right corner of the screen.2. Send an email to info@testifygod.org.We sincerely hope we’ll grow spiritually through sharing with each other. 39 Bible Verses About Family: Family is a harbor full of love and warmth. Without a harmonious family, life will be gloomy, lose joy! How to get along better with family is an important topic for every Christian.